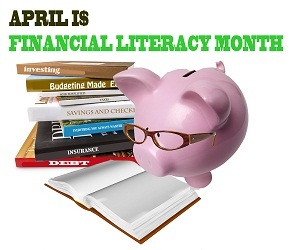 Reaching Your Financial Destinations: Financial Literacy Month - Celebrate Knowledge! "April showers bring May flowers" goes the old saying. It's also a great lesson about the importance of saving - where weathering some light showers can pay dividends during the nicer days that are to come. April is Financial Literacy Month, and a great time to think about some important lessons everyone can learn about finances. Whether you're a parent looking to make talking money with your kids easier or a professional looking for a few tips, there's always something to learn. 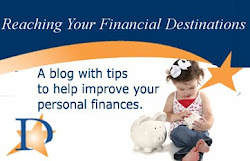 Here are some fun activities you can do to expand your financial knowledge. Most people dread doing anything with their money. Unless there's a serious issue, they don't think about their bills or their paychecks. When something serious comes up, they do little more than panic and figure out how much money to throw at it so it'll go away. Money is scary, and not dealing with it is the easiest thing to do. If you want to improve your knowledge of finances this month, schedule a financial date night. It doesn't matter if you're partnered or on your own, it works the same way. Pick a day when there's nothing good on TV, no major social events and no serious distractions. Put some light music on. Pour yourself a glass of wine. Sit down with your bills, your paycheck and anyone else who matters to your finances, and figure out where you stand. This can be a time to make dealing with your finances fun. You can do a little daydreaming and figure out what your future looks like. Jot down some goals and think about how you can achieve them through your monthly budget. Make a financial date night part of your monthly routine! The second category is the essential, negotiable obligations. These are unsecured loans such as credit cards and student debt. You need to pay them, but if you have to miss a payment, these are the ones to miss. Paying these off is a priority after you make your essential payments, and you may have some room to negotiate and reduce these payments if things get dicey. The third category is the inessential spending. This is everything else you spend money on each month. This is the best place to make cuts when you want to shift your priorities. Making a list of priorities is the first step to making solid plans and reshaping your own financial destiny. When you know where your money is going, you can start to move from financially existing to intentionally spending. That's the beginning of improved financial literacy. Financial security means planning for the day when you can't work anymore. Financial literacy is all about taking an active role in thinking about that future. There are a few concrete steps you can take in April to put yourself ahead of the game. If you're not already doing so, contribute to your employer's 401(k) program. Most employers will match contributions up to a certain level. If you're not contributing enough to get the full amount of that match, you're leaving money on the table. Set up automatic contributions out of every paycheck to automate that savings. April 15 is the last day to contribute to an IRA for 2014. Even if you've already filed your taxes, you can file an amended return to get credit for your contribution. More importantly, you can add to your retirement nest-egg and take advantage of the tax benefits of those accounts. Visit Destinations Credit Union to open your IRA today. There's also no shame in asking for help. Retirement laws are complicated, and it takes an expert to really understand their intricacies. Speaking with a qualified financial planner can take some of the guesswork out of it. This conversation can also help you clarify what retirement looks like: what your goals are, how much you need to save to achieve them and what programs are available to help you get there. If you're counting on Social Security to provide for your entire retirement, you're in for a rude awakening. Benefits are shrinking and the fiscal solvency of the program is always in danger. Taking an active role in your retirement planning is the best way to get some peace of mind about your future. It's never too late. Retirement planning you do at 50 is better than retirement planning that never gets done!